Here's another for DRS Designs blog challenge ~ piercing. This is the last week for this challenge, then we'll have a new one for you next Monday! I kept my piercing simple this time and just went around the entire card base. The images on the larger layer are one NEW big stamp from Drs Designs. You're guaranteed a *jolly* Christmas card using it, that's for sure! For the small accent circles, I used a black glaze gel pen but you could use some gem stones, stickles or anything to add some *bling* to this image! I colored everything w/ my SU markers. 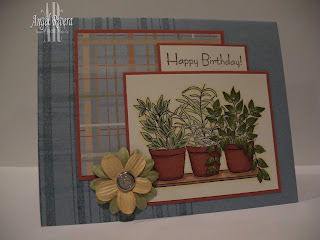 card info: stamps ~ drs designs. paper ~ garden green, red, black, ww. ink ~ black. access. ~ gingham, glaze gel pen, markers. This Monday's challenge on the DRS Designs blog is piercing!! And if you check out my work often, you'll know that I rarely make a card without piercing somewhere, so this is right up my alley! First the lightbulb stamp is DRS Designs' new ribbon slide ~ I made small cuts with craft knife on the lines of the bottom of the bulb (where I colored w/ a silver gel pen) and then I weaved silver cording through them all so they look like a string of lights. I love these because they remind me of Christmas's at my mawmaw's when we had lots of family living close by. Aaahhh, days when life seemed to make sense. 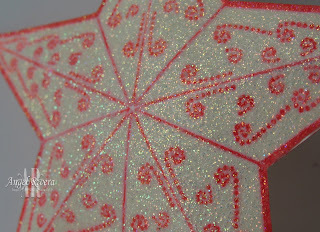 Ok, let me stop there... Back to the card ~ the bulbs also have crystal effects on them, so they're nice and shiny! The pine needles and sentiment are also from DRS Designs. For the larger white panel, I first scored with my plain ol' scoring blade on my cutter (I just eye-balled it), then I pierced inside each diamond. Added the right touch, I think! Thanks for stopping by! card info: stamps ~ drs designs. paper ~ red, ww, choc. ink ~ choc. access. ~ markers, piercer, scoring blade, silver cord, crystal effects, silver gel pen. Stacy decided we should do a shaped card this week, so here's mine! I knew I couldn't cut out a decent rose, so I went w/ a leaf. Not sure I'm liking this, I don't think I do shaped cards very well, but it was fun to try it out and I love this sweet image! I think it'll be cute to put in my hubby's briefcase and write "I could never 'leaf'you", or something cheesy like that! haha! All coloring was done w/ my SU markers. More stuff soon! card info: stamps ~ HM. paper ~ olive, ww. access. ~ markers, scissors, scoring blade for "veins" in the leaf. 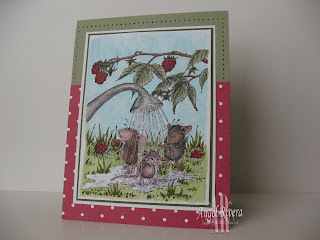 Just a quick cute birthday card using DRS Designs stamps. 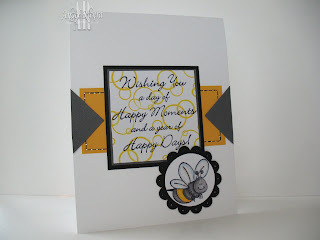 I love that fun circle background stamp and that sweet little bee! I colored him with my summer sun marker and then watercolored the rest w/ basic grey ink (so I could do some shading). I also outlined his wings w/ my bashful blue marker and then covered them with stickles. I'll be posting some sneak peeks of some SOON TO BE RELEASED DRS Designs stamps, so stay tuned!!!!! 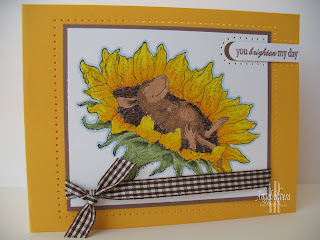 card info: stamps ~ drs designs. ink ~ summer sun, black, basic grey. paper ~ ww, summer sun, black, basic grey. access. ~ punches, stickles, piercer, markers. It's Monday and you know what that means ~ Stacy's Monday Mouse Madness! They have some of the cutest scenes! Everything is colored w/ markers except for the "sky", which I did using turquoise ink and a watercolor brush. All of the water has crystal effects on it to give it that wet look ~ very cool IRL. card info: stamps ~ HM. paper ~ moss, artichoke, ww, dp. access. ~ markers, piercer, crystal effects. This card covers 3 challenges over on SCS. The bling was for the Ways To Use It challenge, and the butterflies and sketch were from the Verve forum. I got these darling butterflies and the satin ribbon from my supah sweet friend, Stacy. I realized today that I had no bling, so ran out to wally world to get some ~ I had other things to get, don't think I ran out there just for that!! 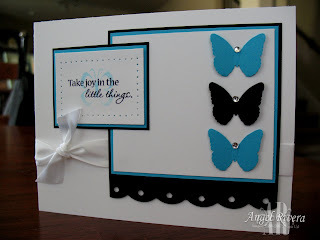 I stamped a butterfly in turquoise under the sentiment after stamping it off once first, not sure if you can see it. Pretty simple but elegant. card info: stamps ~ verve. paper ~ ww, black, turq. ink ~ turq, black. access. ~ ribbon, piercer, cropodile, bling. I should be back later to upload a card! See ya! Playing around with some DRS Designs stamps. I *love* these plants. I tried hard to use different colors so they each have their own look. I'm quite happy w/ how it turned out! And you see that plaid on the card base?? Yep, how cool! That's a plaid maker stamp! Love it! I inked it up and stamped it vertically, then inked it again, and stamped off once before stamping horizontally. I had picked out the dp before even thinking to stamp on the card base ~ love how that works out! And yes, I colored everything w/ my SU markers. I used olive, celery and artichoke for the leaves and rust and caramel for the pots and caramel for the shelf. Do you see those primas? Yea, well, I had not meant to put that there but while stamping my plaid bg, I accidently stamped on that corner of my image! AAARRRRHHHHHH!! Fortunately, it was just the corner and I immediately thought "primas!". And that little brad is too cute, has a leaf on it and matches the dp. And look, no piercing!! Ok, better go for now. We're watching the weather closely and should be getting pounded with rain in about an hour!!! 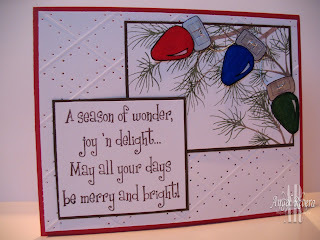 card info: stamps ~ DRS Designs. paper ~ bordering blue, rust, dp, vanilla. ink ~ choc, bordering blue. access. ~ primas, brad, markers. She sent me this image a while ago (thanks, hon!). So much fun to color!! All coloring was done w/ SU markers. I searched and searched for dp to go w/ this image, but decided it stood well on it's own, kinda the whole "stamp simply" philosophy that Sharon J. goes by. Added a Verve sentiment and piercing plus some gingham that I've had forever! 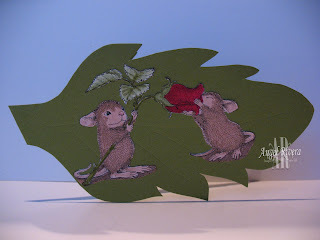 card info: stamps ~ house mouse, verve. paper ~ summer sun, cocoa, ww. ink ~ choc. access. ~ punch, ribbon, piercer, markers. DRS Designs first blog challenge!! 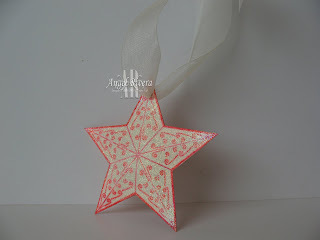 Our first challenge over on the DRS Designs blog is inchies!!! How fun!! If you don't know what an *inchie* is, I'm sure you can take a guess by looking at my card. Yes, it's a 1 x 1 square inch of art that is the focal point of your card. Now, you can use more than one inchie on a card, as you'll see by the other fab DRS designers! 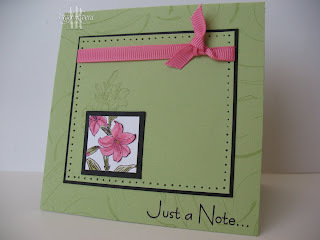 I just *love* this flower stamp! I decided to focus on one of the flowers, which I colored w/ SU markers. The flower is cut out and popped up a little for extra dimension. 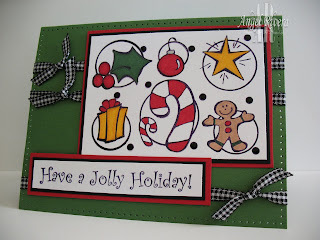 I also used one of our easy background stamps around the card base. I also love the font of the sentiment, clean and casual. I almost didn't add the piercing, but couldn't help myself! Almost forgot to tell you, this is a 4x4 square card ~ such a cute, fun size to work with! card info: stamps ~ DRS Designs. paper ~ celery, black, ww. ink ~ black, celery. access. ~ ribbon, piercer.